You will never tire of the spectacular views overlooking Opito Bay and the Bay of Islands from this welcoming kiwi beach house. The perfect location for relaxing, fishing, boating and diving – you don’t have to go far to catch fish, you can even use the dinghy and fishing gear provided! A quick 3 minute walk to a very safe swimming beach, ideal for children and the boat ramp easily accessible anytime. Best of all is the soothing spa pool, which is fantastic after a day at the beach, out on the water or after exploring the native bush walks. • This traditional kiwi beach house comprises four bedrooms, an open living and dining area including a drywood fireplace (perfect for the winter escape), separate laundry and a well equipped kitchen with a dishwasher and oven. • The outdoor deck area comes complete with a gas BBQ, outdoor furniture and spa pool set among palm trees and native plants. • Ample parking for cars and a large boat, there’s even a station to fillet your fresh catch of the day. • Complimentary use of a dinghy and basic fishing gear. • 15 minutes by boat to some of the best diving spots. • A kiwi sanctuary – hear kiwi at night and explore the DOC tracks in the day. Bay of Islands and Northland has to offer. Suitably close to the vibrant township of Kerikeri, well known for its restaurants, vineyards, boutique craft shops, market, golf course and historic sites. 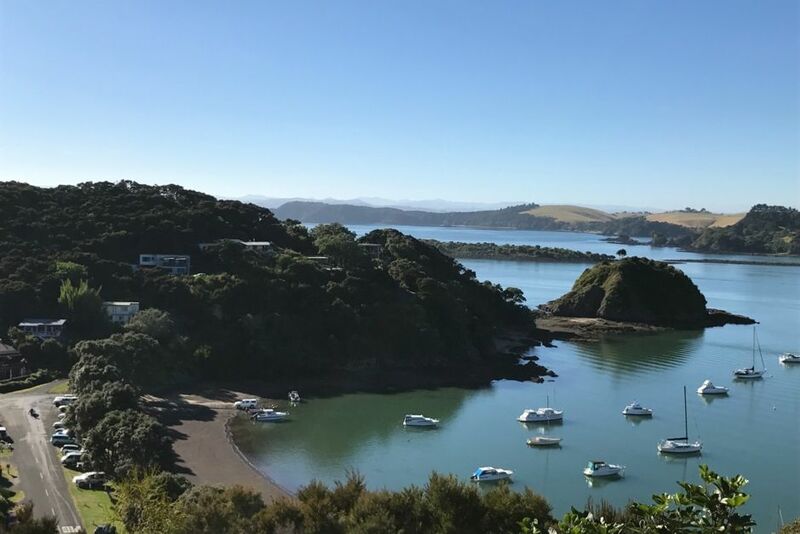 Escape to a tranquil, peaceful bay - ideal for a family, romantic getaway or as the perfect base for all your water adventures. Come and experience it for yourself. Great bach with three big double rooms and a fourth with bunks for the kids. Well-equipped with everything. Short walk down to the beach. Nice views of the bay and the big bonus, a spa pool on the deck - be awesome in winter with that and the log bunrner inside. Hard to fault, really. Beautiful location and view. Well appointed with very comfortable beds. The spa was an added bonus. What a perfect place to holiday with extended family! We thoroughly enjoyed the view, the deck for every evening meal, the short stroll to Opito and AkeAke Bay. Our main advice is to bring plenty of mosquito repellant, because once the sun is down, they are abundant! We highly recommend this lovely home to any family groups traveling through Kerikeri - it is perfectly positioned for peace and quiet, and accessing the beautiful locations of Northland. The house exceeded our expectations!! Once we got at the house, we just loved. Bedrooms are excellent, kitchen had all we needed but the highlight is the spa pool and outdoor table with a perfect view.The house exceeded our expectations!! Me and my family had an awesome time!! Thank you so much for having us and definitely we will contact you guys again. The view and the property are just as described. Can't say enough about the relaxing family time we had at Alister's property. The view of the bay is beautiful from the main living area of the home, 2 of the bedrooms as well as the deck. Well appointed with everything you need for a vacation stay whether you cook inside or on the grill. The spa is a nice added touch for morning coffee with a view of the bay or evening soaking. The walk to Te Tii and the beach was easy, and the walk along Akeake Point Historic Reserve was a nice add-on close by. The well-stocked shed of split firewood for cool evenings was appreciated as well! Stunning view from a hot tub, perfect! The Bach is beautifully placed. And very well equipped. We really enjoyed our stay at Opito Bay, so peaceful. Evenings in the hot tub were the highlight for us. The only slight downfalls of the Bach were the kitchen was a bit grubby and the huge drop from the back yard off of the decking, may just be worth warning to future visitors.